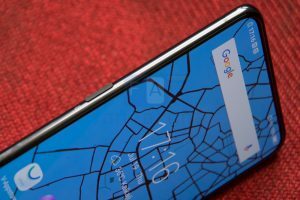 When Vivo announced the Apex concept at Mobile World Congress, nobody expected to see an honest to goodness retail smartphone based on it this soon. Now that we’ve spent some time with the hardware, here’s what we think about it. 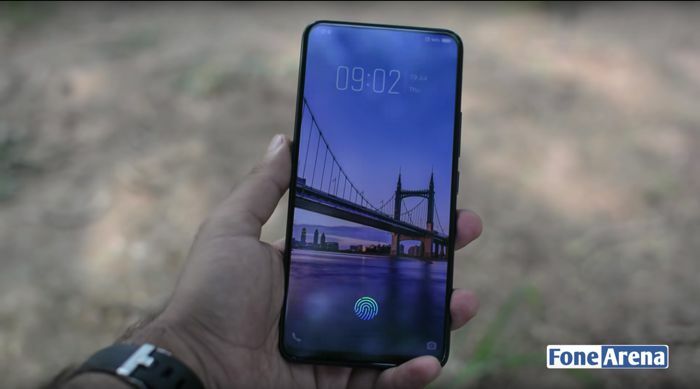 Honestly, I’d have liked it if Vivo stuck with the name Apex. After all, this phone really is packing the best mobile tech components available. Only the second phone with an in-screen fingerprint sensor and wait for it… no notch. All that in addition to top of the line specs. If that’s not the definition of Apex, I don’t know what is. 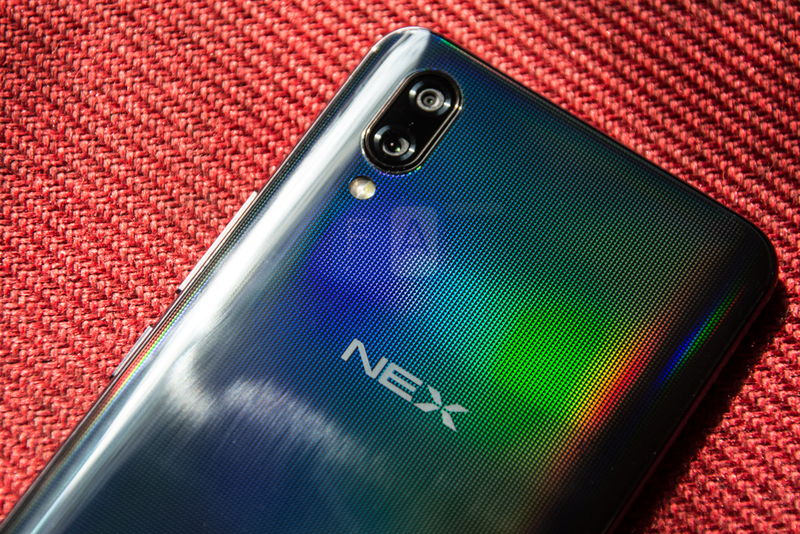 The Vivo NEX is an almost perfect example of design minimalism. Vivo was going for an almost completely full screen look with the phone and they’ve pretty much achieved it. Up front is a huge 6.59 inch screen that somehow still manages to be pocketable, ergonomically usable thanks to the 19.3:9 aspect ratio. 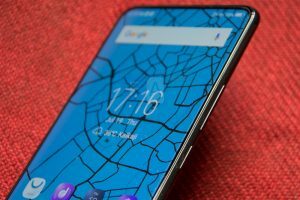 Vivo claims a 91.2% screen to body ratio but let’s face it, the feature we’re most excited about is the lack of a notch. But wait, how does it manage this seemingly impossible feat? Tap the front facing camera button and up pops open the mechanical slider. 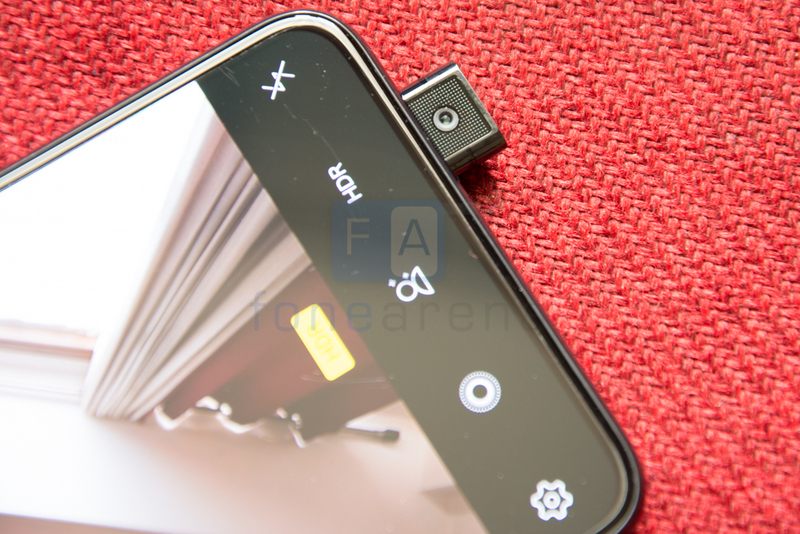 The Vivo NEX isn’t really the first phone to have some sort of mechanised front camera but the sheer coolness factor of the camera module sliding out simply can’t be negated. By hiding away the front facing camera, Vivo was able to get rid of the notch and hence you have an almost full screen design. The camera module is spring-loaded and if you press down on it manually, it’ll simply move back so you don’t really need to worry about durability. 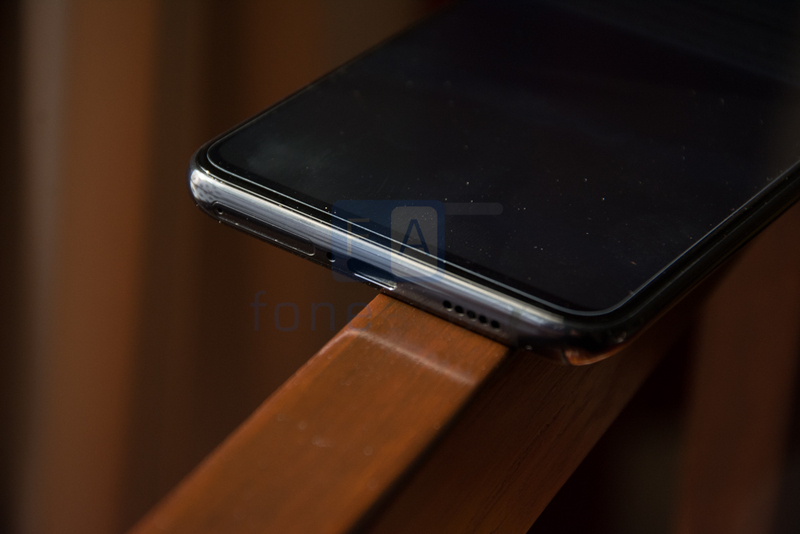 There’s glass both at the front and the back to prevent scratches and a metal structure that makes it stronger. Talking about full screen design, there’s no earpiece here either and instead you’ll find a piezoelectric speaker which you’ll remember from the Mi Mix. It sounds fine. Not as good as a regular speaker on competing devices but we didn’t find it particularly problematic. Along the bottom is just a tiny chin. Unfortunately no Android OEM has managed to get rid of the lower chin yet, probably due to cost constraints. 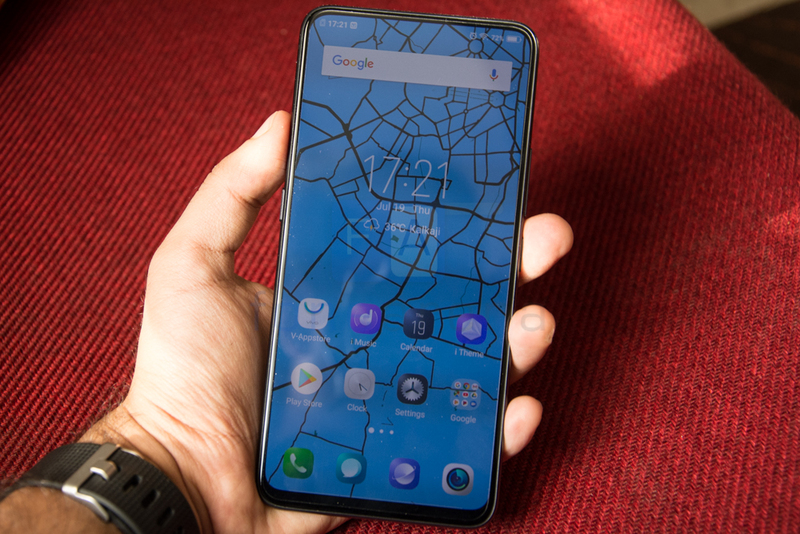 The Vivo NEX is a refinement of the standard glass sandwich style with an aluminium frame in the middle. Along the side is a volume rocker as well as a power button. Both offer really good feedback. Meanwhile on the left is a dedicated AI button that invokes the Google Assistant. Along the bottom edge is a single speaker, USB Type C port and a dual SIM slot. No microSD slot on this one. The 3.5mm audio jack is placed at the top. Now there’s one feature that we haven’t talked about yet and that’s the under-screen fingerprint sensor. When we first received our review unit, our impressions weren’t very positive. The fingerprint reader appeared to be buggy and rarely worked. Over a slate of updates, one as recent as last evening, the performance has gotten much better. To the point that we can more or less reliably unlock our phones without having to resort to the pin code. It is understandable that being first generation technology, it wouldn’t as fast as a regular fingerprint reader but hopefully we’ll get there soon. No, the phone doesn’t do face recognition. Lately, there’s been a trend of experimenting with interesting finishes for the rear panels. Huawei did it with their rainbow finish phones and now, so has Vivo. Under the Gorilla Glass is a very pretty pattern that glitters and gleams in a rainbow finish under direct sunlight. There’s of course, the dual camera sensors placed along the top edge. 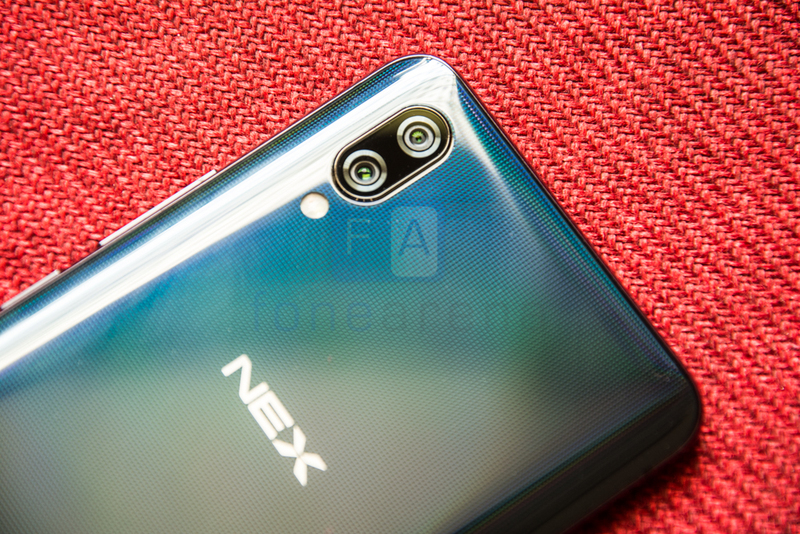 Ergonomically speaking, the Vivo NEX is a really large device. Large and heavy, the weight distribution is skewed towards the upper half because of the servo motor. 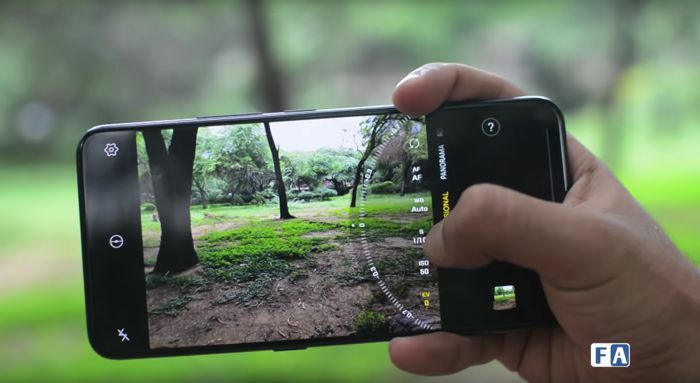 You can forget about one-handed use and you will definitely have to be a bit careful that the phone doesn’t slip out but that’s the sacrifice you have to make to get a beautiful large canvas for viewing your content. The onboard Funtouch OS is a drastic departure from stock Android. Pulling down from the top reveals the notifications tray as well as a search bar. The notification icons are grouped by app. Meanwhile pulling up from the bottom left corner displays a control centre which has a brightness slider, commonly accessed toggles as well as recently used apps. If you’re coming over from iOS, you’ll be right at home. There is a bit of learning curve for everyone used to the standard Android UX paradigm. There’s also a whole bunch of preloaded apps and customisations. From the Always On Display, to the smart gestures and even the gesture based navigation. 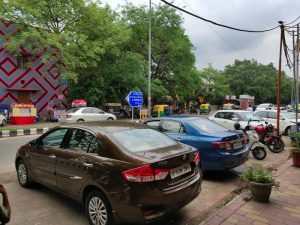 While adoption of navigation gestures hasn’t been universal, heck even ASUS hasn’t implemented them on the Zenfone 5Z, the gestures on the Vivo NEX work beautifully and you just can’t go back. Honestly speaking, we’ve not really been fans of custom ROMs but it can’t be denied that FunTouch OS has some very usable features. Our suggestion? Pair it with Nova Launcher for a great user experience and the extra features. Let’s talk performance. The phone is running a Snapdragon 845 chipset with 8GB of RAM. Performance is really the last thing you’ll need to worry about. While we initially faced a few kinks, regular software updates over the last few days has really improved performance. The handset simply flies but that’s exactly what you would expect from such a high-end device. We ran a whole bunch of games, emulated consoles all the way to the Dreamcast without a hitch. Like any other phone packing a Snapdragon 845 chipset, this is in line with the best performance you’re going to get right now. Like it or hate it, Funtouch OS is very well optimised for the hardware and we didn’t observe a single deal breaking slow down. We noticed general latency in usage earlier on in our review cycle but this has since been fixed via software updates. 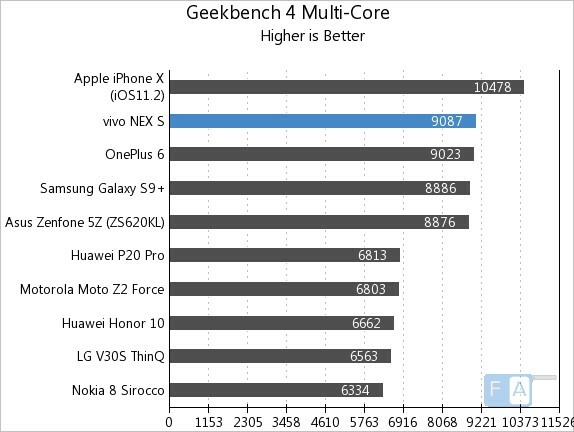 In Geekbench 4, the NEX S scored 2437 points. 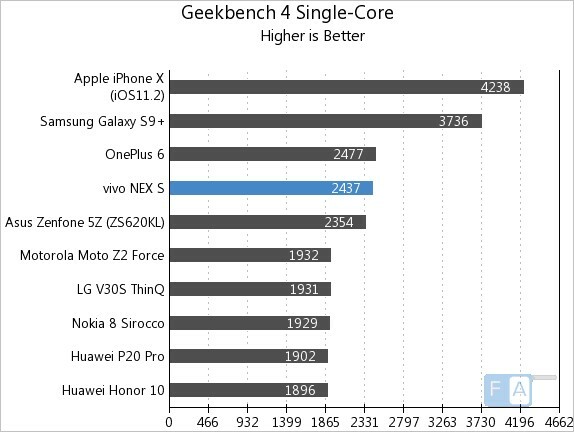 In Geekbench 4, the Vivo NEX S scored 9087 points which trails only the iPhone X. 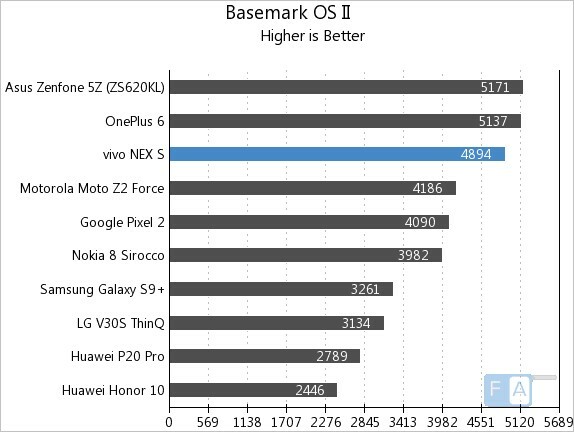 In Basemark OS II, the Vivo NEX managed 4894 points. 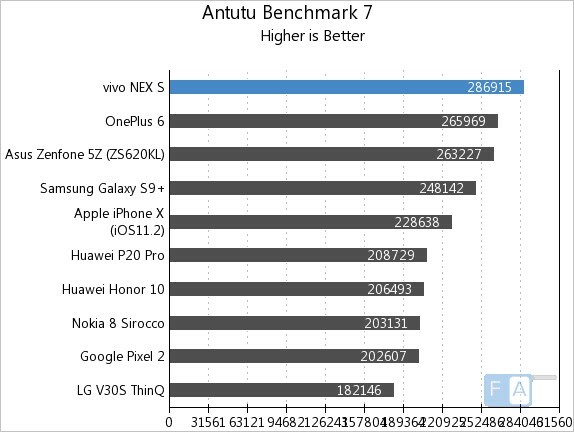 In the AnTuTu 7 Benchmark, the Vivo NEX was at the top of our test bench with 286915 points. The Samsung sourced super AMOLED panel has a Full HD+ resolution. Okay, so one glance at the screen and you’ll notice that it isn’t really the most accurate panel around but damn, if you like multimedia content.. this screen shines. Big, vibrant, demonstrating excellent viewing angles and deep deep blacks. The screen is also perfectly visible outdoors. With the notch gone once again, you get an absolutely gigantic canvas that makes content so much more immersive. 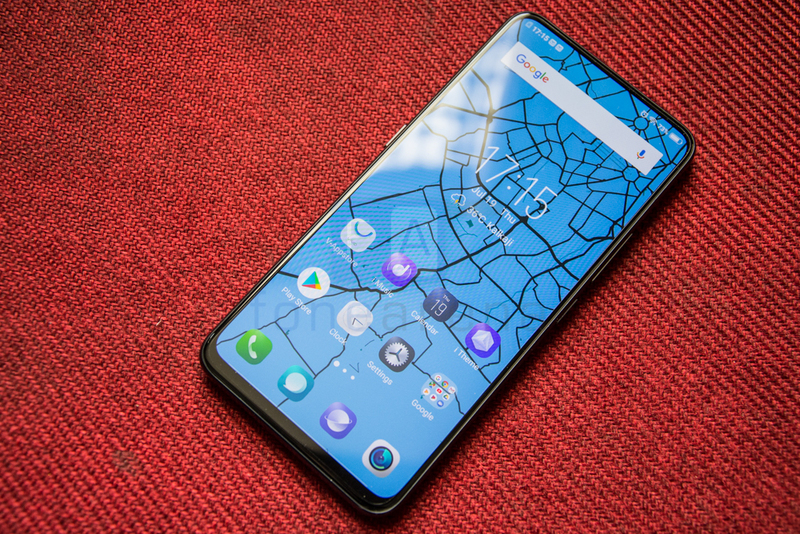 Be it Netflix, YouTube videos or games, the Vivo NEX is one of the few phones with a screen large enough to do them justice. The primary camera is a 12MP sensor with an f/1.8 lens, dual pixel phase detection autofocus as well as optical image stabilisation. The secondary depth sensing camera has a 5MP sensor with f/2.4 aperture. 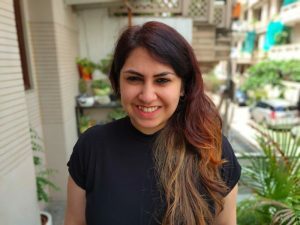 There’s a lot going on with the camera software on the Vivo NEX. Be it beautifying features, filters or a full-fledged pro mode, the Vivo NEX does it all. 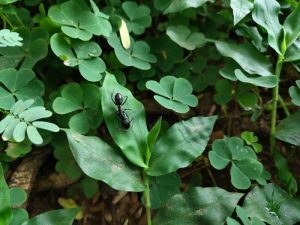 The standard photo taking mode is relatively straightforward. We say relatively because tapping a button brings yet another mode where you can manually select filters or use the built-in AI engine to automatically pick out the best filter. Image quality is good but not quite the best out there. The software has a tendency to go overboard with the noise reduction and creates images that are a bit low on details. This is even more apparent in low light shots where images often appear a bit blurry. The software also has a tendency to oversaturate colours. 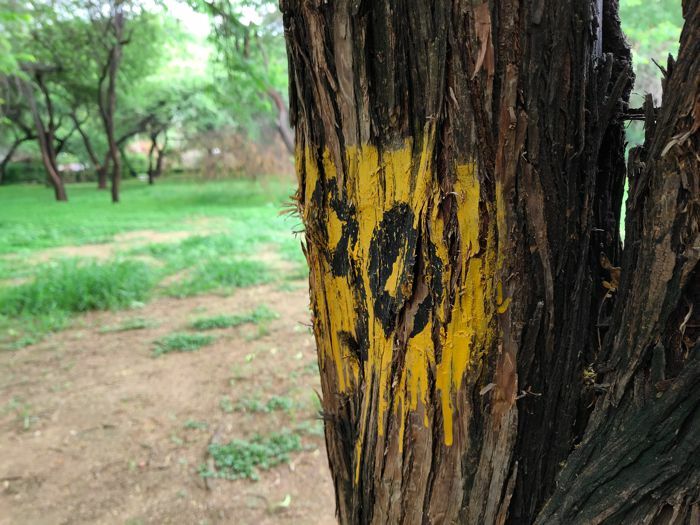 For what its worth, if you’re the kind of user who bumps up the saturation level while editing photos, you probably won’t have any issues with the shots from the Vivo NEX. Check out more image samples below. The Vivo NEX is equipped with dual SIM card slots, both of which support 4G VoLTE. There’s WiFi 802.11ac support as well as Bluetooth 5.0. You’ll also get GPS+GLONASS and USB Type-C though speeds seem to be limited to USB 2.0. Out of the 128GB of storage, there’s 107GB available. This cannot be expanded via a microSD card. Battery life, you ask? With a massive 4,000 mAh battery and the 10nm process of the Snapdragon 845, the NEX was bound to deliver good battery life. We consistently achieved over 6 hours of screen on time and the phone can easily last a full work day with battery to spare. 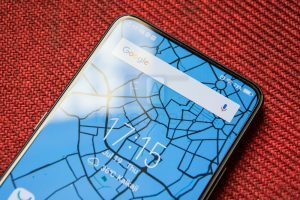 So, what do we think of the Vivo NEX? There’s no doubt that the phone will be remembered as a milestone. Between the unique attempt at maximising screen real estate and the under-screen fingerprint reader, the top of the line specifications, this ranks up there amongst the most feature packed and cutting edge devices available today. The lack of IP68 protection, wireless charging and NFC are a definite miss but in exchange you get a gigantic screen, battery life that lasts a solid work day and the sheer coolness factor of that pop up camera. 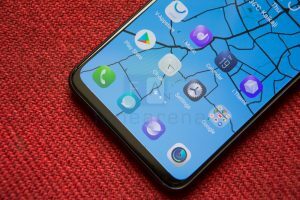 We might not be big fans of some of the design choices of Funtouch OS but there’s no denying that it is very well optimised and tuned for the Vivo NEX. All in all, the phone is perfect for anyone is simply bored by the blandness of more mainstream hardware and wants to live on the bleeding edge of technology. 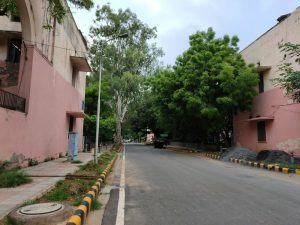 The OnePlus 6 and the Zenfone 5Z are great options for someone looking for value for money but at Rs. 44,990, the Vivo NEX cuts through the crowd and gives you the kind of innovation that have always made flagships worth their asking price. It is available on Amazon.in.